‘Miscreants’ from Meghalaya reportedly entered Chinthong in West Karbi Anglong district of Assam on Tuesday and put up a signboard proclaiming that the area belongs to them. Though things have come to such a pass, the Assam Government and the Karbi Anglong Autonomous Council (KAAC) authorities are still in “deep slumber” and are yet to realise the gravity of the situation. However, the Deputy Commissioner (DC) of West Karbi Anglong, Debojyoti Hazarika, informed that a meeting will be held on July 20 next between the Meghalaya and Assam Governments on the border issue. Tension seems to be reportedly simmering at the Assam-Meghalaya border too as miscreants from the neighbouring State are trying to “create unrest”. 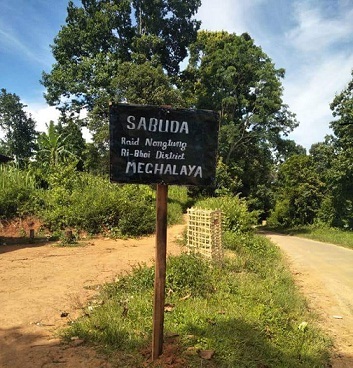 It is reported that “trespassers” from Meghalaya entered Assam and damaged a signboard put up by the Forest Department and replaced it with their own on which was written – ‘Sabuda, Raid Nongthang, Ri-Bhoi District’. According to sources, on Tuesday, people from Ri-Bhoi district of Meghalaya entered Sabuda in West Karbi Anglong. The group vandalised the signboard put up by the Range Officer of Umjakini Range and replaced it with the said signboard. Forest Department of Karbi Anglong. The same group also set ablaze a road roller at Umpakalang. The miscreants’ group damaged the boundary walls of few half-constructed buildings – all under various Government schemes. He urged both the Governments of Assam and Meghalaya to solve the border skirmishes at the earliest so that the people living along the border areas can “carry on with their routine life in a peaceful manner”. Debojyoti Hazarika also informed that the signboard put up by trespassers from Meghalaya was removed by the Karbi Anglong Forest Department staff on Wednesday and was seized by the police of Ulukunchi Outpost.